DuoSTATION® MDM v4.8.17 has new features, optimizations and bug fixes. Here are the most important ones. We have speeded up app management and loading time for the ‘Apps’ view a lot. More info is logged when a device location is displayed in Console. Added logging when a configuration is moved or deleted. Possible to see installed apps of devices that should be inaccessable. Some %-variables were not always translated in ‘App settings’. Wallpaper was changed on more that one device when using the command for sigle device. A newly enrolled Android device was registered as ‘rooted’ before a second inventory was performed. The import of users från AD crashed when the phone number was missing. ‘Clear passcode’ is now correctly implemented for devices running Android 8+. In order to get this to work on already enrolled devices, the user is prompted by the MDM-app to enter the current passcode. It’s possible to use longer URLs and URLs containing ‘#’ is now accepted as valid. Now configurations for Android devices are deployed in the same order as Apple devices. That is, first ‘Restrictions and Passcode policy’ and then other configurations. Lastly apps will be deployed. We have changed so that ‘Allow installing non-Play apps‘ is restricted as default. ‘Allow debug mode‘ is a new restriction for Android devices. Requires that devices has ‘device owner’ enabled and runs Android 7 or later. ‘Allow personal hotspot modification’ is added for iOS devices. Requires that the device is supervised and runs iOS 12.2 or later. 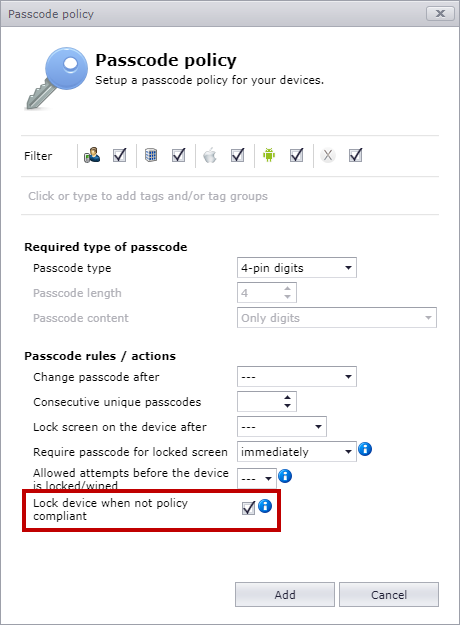 We have added a setting that prevents the device to use apps and other resources, deployed by the MDM, when the device is not passcode compliant. Requires that devices has ‘device owner’ enabled and runs Android 7 or later. 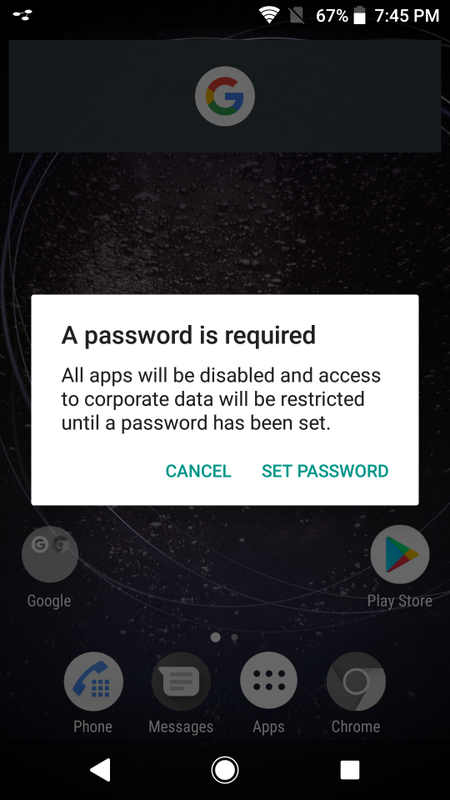 If not policy compliant, for instance the passcode is missing or to short, the user will be prompted to set a passcode and most apps will be deactivated. After 5 minutes these apps will be hidden. All apps and other configurations, deployed to the device, will be paused when not policy compliant. Adusted layout so scrollbars aren’t shown in the forms in Console when using the web browser in zoomed mode. We have finally integrated MDM with Managed Google Play (MGP). This makes it possible to deploy apps from Google Play to Android devices without the user has to add a Google-account on the device. 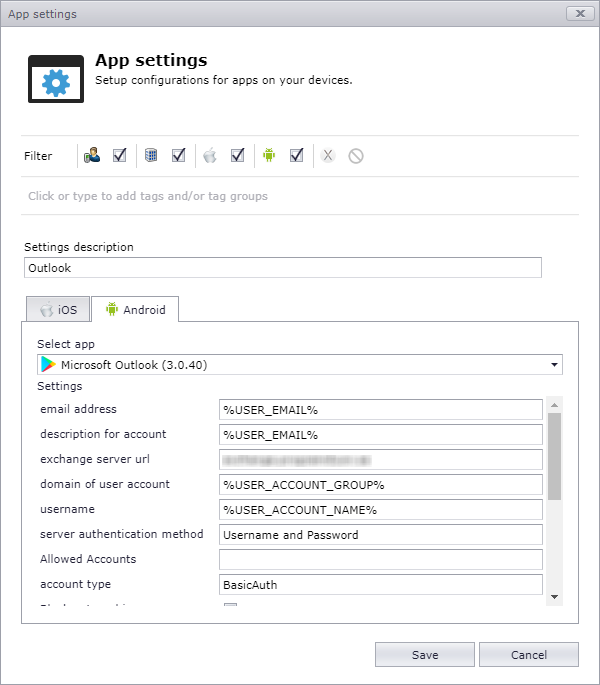 When the device is enrolled, the system creates an account that the MDM will use to deploy apps. In order to work, the MDM-app must be activated as ’device owner’. Besides deploying apps smoothly, it’s also possible to select which apps that should be available in Play and control which permissions to sensitive data app should be granted or not. Also shortcuts to web apps and private apps can be deployed by MGP. The document Getting started with Managed Google Play contains information how to get started with MGP. 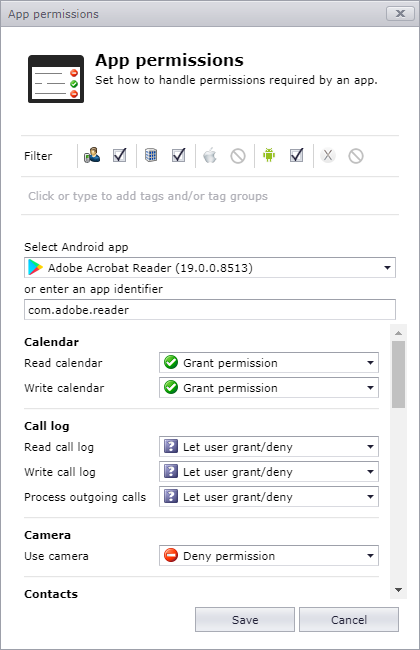 New configuration where you can grant or deny permissions to sensitive data on app level. Now it’s easier to control the settings of Android apps. A form with all possible settings is displayed automatically. Also, we automatically fill in the form with %-variables for Gmail and Outlook to make it even more easy. Twice a day the system automatically imports/updates information about all Android apps handled by the system. A new column ‘Google enterprise’ has been added to the view ‘Devices’. In ‘Device details’ information about MGP is displayed in the Android-tab. In the MDM-app it’s possible to see if ‘device owner’ is activated and if a MGP-account has been created. For devices that are already has ‘device owner’ activated, it’s possible to create MGP-account from Console. Select these devices in ‘Devices’ and use ‘Actions>Google>Assign enterprise for selected devices …’. It’s also possible to control which apps should be available in Play.